MUMBAI.When we talk of learning dance in a complete, wholesome and structured manner, one institute that always crosses our mind is the renowned Nalanda Dance Research Centre in Mumbai, spearheaded by Padma Bhushan Dr Kanak Rele and her highly talented daughter-in-law Dr Uma Rele. 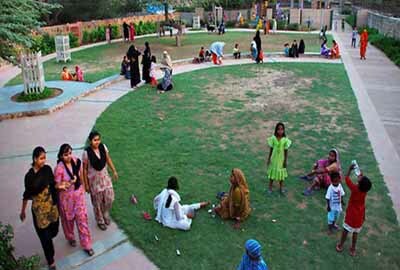 Nalanda is a non-profit public trust and undoubtedly a premier institution enjoying a unique position in the world of dance and education. This institute that follows the guru-shishya parampara was established in 1967 by the renowned Mohiniattam dance exponent and scholar, Dr Kanak Rele, as an institution to impart traditional training in classical Indian dancing. Nalanda blossomed by 1973 into a unique three-tiered institution with foundation classes for pre-university children, “Nalanda Nritya Kala Mahavidyalaya” a college of classical dancing affiliated to the University of Mumbai providing formal academic education and its different departments for post-doctoral and fundamental research. 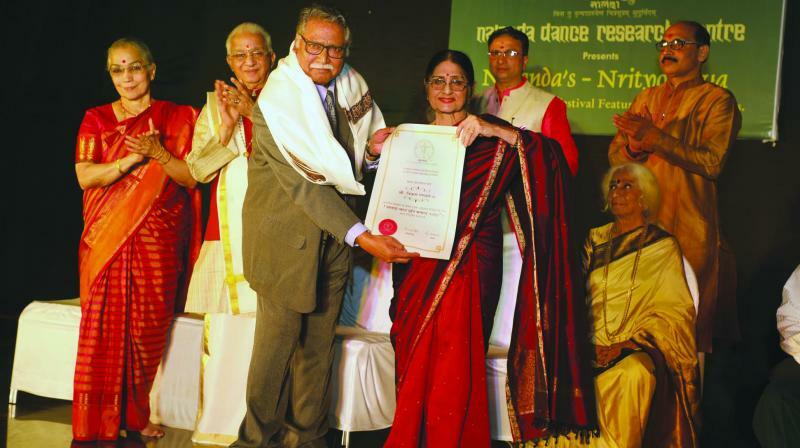 Nalanda Dance Research Centre is an officially recognised research institute by the ministry of science and technology, Government of India, the only dance institution to get this recognition. But today I want to highlight another beautiful and giving side of Nalanda. Teaching and imparting dance knowledge is just one of the feathers in its cap. Almost a decade back, from 2011, Nalanda initiated a process of honouring individuals who have acquired iconic status by awarding them with the “Bharata Muni Samman”. At their renowned dance festival, Nalanda Nirityotsava, which is a four-day celebration of Indian classical dances. Dedicated to the preservation and propagation of Indian dance in particular and Indian culture in general from its founding in 1966, the Nalanda Dance Research Centre has unswervingly trodden on its chosen path with single-minded determination. Nalanda has always upheld the pricelessness of all that is India and her great ancient culture which consists of the various performing arts, visual arts, the mother of all languages, Sanskrit and sanskritic studies, the religio-philosophical thought and other co-related facets. Dancers from all over India took part for this year’s Nalanda’s prestigious title of Nirtyotsava, dancers from Maharashtra, Delhi, Bengal, Chhattisgarh, Karnataka, Assam, Kerala, Andhra Pradesh and many other states were seen showing their skills to bag the Nalanda Nritya Nipuna award. Finally, at the end of four dances in a celebration of art and culture the following dancers won the Nalanda Nritya Nipuna award at the Nirtyotsava, 2019. Tamana Tanna for Odissi, Sukanya Kumar, Naveen R. Hegde, Shruti Ashokan, Divya Bhatt and Atanu Das for Bharata Natyam, Varsha Dasgupta and Priya Samarth for Kathak, Sandra Pisharody and Unnati Ajmera for Mohini, Kankana Singh for Manipuri and Ruchi Krishna for Kuchipudi. On the third day of the celebrated festival, the Nalanda Bharata Muni Samman Samaroha was held. In the past legends like Kishori Amonkar, Dr Vijaya Mehta, Pandit Hariprasad Chaurasia, Ratan Thiyam, Pandit Jasraj, Kumudini Lakhia and many others have been bestowed with the Bharata Muni Samman. This was no less celebrated, with vocalist Dr Prabha Atre, Bharata Natyam exponents. Shanta and Dhananjayan and actor Vikram Gokhale honoured with the Bharata Muni Samman. Very passionately and fondly, Dr Kanak Rele spoke of this year’s Bharata Muni Samman awardees. She informed that Dr Prabha Atre is one of the seniormost and distinguished vocalists of Kirana Gharaanaa of Hindustani music. She is also a distinguished researcher and teacher. She is also well known for her meaningful insight and experimentation and innovations in treatment, design and presentation of the musical material. Whether in Khyaal, Taraannaa, Thumri, Daadraa, Ghazal or Bhajan, her total commitment to her art and sensitivity to the needs of the times clearly place her in the distinguished company of a very few thinking Hindustani vocalists. 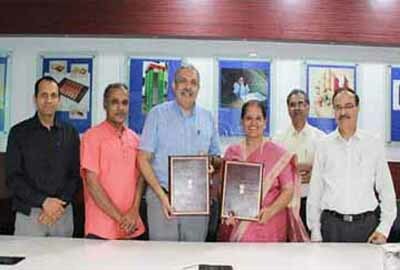 She is also acclaimed as a research guide at the university level. The most beautiful part is that Dr Prabha Atre was trained in the traditional “guru-shishya paramparaa” by the Late Sureshbabu Mane and his famous sister, Padmabhushan Hirabai Badodekar, both stalwarts of the Kirana Gharaannaa. She also drew much inspiration from the styles of renowned maestros, Amir Khan Saheb and Bade Ghulam Ali Khan Saheb. Dr Rele also informed that Dr Atre has authored academic books on various aspects which are relevant to research on musicology. She is the author of distinguished books having high academic value. Dr Atre has been honoured with the Padma Shri, the Padma Bhushan, the Sangeet Natak Akademi Award and the Tagore Akademi Ratna as also the Kalidas Samman, the Tanariri Sangeet Sanman, the Bharat Ratna Pt Bhimsen Joshi Shaastreeya Sangeet Jeevan Gaurav Puraskar and many more.